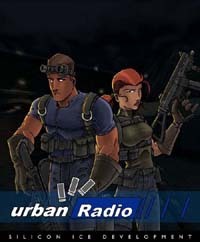 Starting December 14, 2001 and running until January 26, 2008, Urban Radio was live programming that debuted on the Internet in support of the Quake III Arena mod, Urban Terror. Originally called Radio Oz, it took just a single show before Urban Radio was initiated and became the source for information and entertainment for all things Urban Terror related. Prior to many ClanBase matches, the pre-match entertainment would be a 60-90 minutes show discussing the happenings in the realm of Urban Terror as well as information about the match we were preparing to cover. Urban Radio became the cornerstone before all Urban Terror releases. The show was unofficially debuted on May 18, 2001 when Blankz hosted a pre-release party with myself as a guest. The response to the radio show was incredible! Gamers from around the world tuned in to hear what Urban Terror Beta 2.0 was all about. December 14, I would air a pre-recorded Urban Radio due to technical difficulties to start my on air run. Urban Radio was one of my contributions to the Urban Terror community, used as a team platform, as well as a soapbox to call out issues that needed to be addressed. The show was researched, produced and delivered as a one man show. Many hours went into the production of a single show. Thankfully there was a lot of information and support for the mod, which made piecing the show together easy. That wouldn’t always be the case, as the development team would cease development releases and go on hiatus for unspecified periods of time. Beta 2.0 provided the basis of all future development. While the game wasn’t finished at that point, the team did start parallel development on an unclassified project titled ‘MX’ or ‘Mercenary-X’, a stand alone project that was supposed to be used as a platform to showcase our talents as Frozen Sand, LLC. We also released information on the website and Urban Radio about porting Urban Terror to Enemy Territory (ETUT). Urban Radio featured the news and notes from the development team, as well as the community. The Urban Terror Forums, of which I created and moderated provided hours of programming, from level design and game play to future development and online interviews, nothing was sacred when the ‘ON AIR’ sign was turned on. Each week Urban Radio sponsored the “Urban Radio Server of the Week” allowing me to spotlight a online Urban Terror server, which the community played on while we were on air.